Page Street Publishing, 9781624147715, 192pp. Born and raised in the Philippines, Abigail Raines traveled extensively in Southeast Asia to bring its flavors right to your plate. 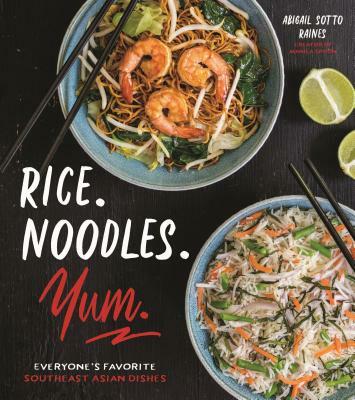 Her travels taught her that noodles and rice are the perfect canvas for the sweet, salty and spicy flavors of Asian cuisine—inspiring her to create this delicious collection of recipes. Expand your palate with Curry Noodle Soup with Chicken (Khao Soy Gai) and Filipino-Style Paella (Beringhe) or make restaurant favorites like Pad Thai and Pho Bo. Learn how to make staples of authentic Asian cuisine like compressed rice (Ketupat), dumplings and spring rolls, and taste a variety of national dishes from Vietnamese Grilled Pork with Rice Noodles (Bun Thit Nuong) to Indonesian coconut pancakes (Serabi). With Rice. Noodles. Yum. you’ll be able to replicate the rich flavors of home-style Asian cooking, street food fare and everything in between. Abigail Raines is the creator of the food blog Manila Spoon. Her recipes have been featured in Taste of Home magazine, The Huffington Post, Buzzfeed and Delish. She lives in Hamden, Connecticut.